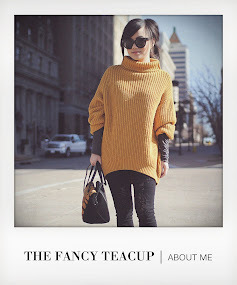 the fancy teacup: claim the sky. Those who are close to me know that I'm a major proponent of low maintenance when it comes to hair care and beauty regimen. I do prefer not to spend more then 15 minutes getting ready for work every morning. That includes brushing my teeth, washing my face, inserting my contacts, applying my makeup, and getting dressed. I have received numerous inquiries on my hair care process over the course of having this site, so I wanted to provide some general insight of what my hair care routine encompasses. I use conditioner everyday, and shampoo + condition once a week. My hairstylist is awesome and inexpensive. I generally only get my hair done by her twice a year, and have her trim and texturize my hair (the keyword here is "texturize") all for a measly 25 bucks. With a little dry shampoo and volumizing powder here and there, viola! I achieve the "ooomph" you see in my hair on consistent basis. And believe it or not, I use all drugstore brands. No pricey salon products, although I am certain my hair would turn out immaculate if I did, but I'm pretty staunch on being low maintenance when it comes to spending on hair care products as well. Which leads to this. When hair care online retail store, Misikko, contacted me about the Hana 1.5" flat iron product, I was pretty stoked. The product was shipped out the same day of communication with all sorts of goodies, including the Hana Shine Shield Thermal Protectant. I generally in the past just used water to straighten out the occasional waves in my hair in the morning, so I have never gotten around to investing in a flat iron. However, the slight waves do tend to return midday. The initial time I tried the product (and subsequent times as well), it literally took me less than 5 minutes to straighten out my hair using the Hana 1.5" flat iron product sent by Misikko. Granted, those who have naturally wavy/curly hair the process may take about 15-20 minutes longer, but this product works wonders and is fast. It also has a wide range of temperature settings and with the Thermal Protectant, it provides an adequate amount of shine. Needless to say, I'm pretty stoked of owning a Hana 1.5" flat iron, and that's coming from a pretty low maintenance gal. Check out the product here. I apologize for the biographical post today! But hopefully it helped answer some of your (my lovely readers!) questions. Have a wonderful week, y'all! I love that top! It's so cute. OMG, love the top, the shoes, and the shorts....!!!!! So glad we'll have matching shoes and tops! YAY! Excellent backdrop choice too! The scenic colors blend perfectly with your outfit! Love you! You look adorable Jamie! That kimono is adorable! This top is adorable, nice look! Love the wedges, too. jamie, those shoes look gorgeous on you!!! I have seen them before but never on... they look great on you! love the kimono top also. Lovely outfit Jamie! That kimono top is so dreamy and I love your wedges. You look really gorgeous, as always. I'm also really low-maintenance when it comes to my hair, except for my highlights that I get once every 3 months. Absolutely love your outfit and your shoes! LOVE the top, really love those gorgeous wedges as well! Your hair always looks stunning. Lovely kimono and great photos! love the shirt!!! follow on bloglovin! Really love your kimono top ! Your shoes are great too ! The colors of the kimono are wonderful!!!!! And look great on you of course! Only 15 minutes to look that great! Wow! Your outfit suits you so well. Very cute. you look stunning!! wonderful blouse and shoes - I love everything in this outfit! Beautiful photos! I have to say your kimono top is so cute!! And love your shoes!! Your hair looks FAB and your outfit is AMazinG as always!! your kimono is so pretty, i love the sleeves!! gosh i love your unique top! yes, that kimono is soooo great! Wonderful pictures! :) I like very much! BEAUTIFUL. Love your whole outfit! Lovely hummingbird kimono girl! You look so beautiful. lovely look! have just come across your blog and i adore it! beautiful kimono! Love the necklace as well! LOVE this! 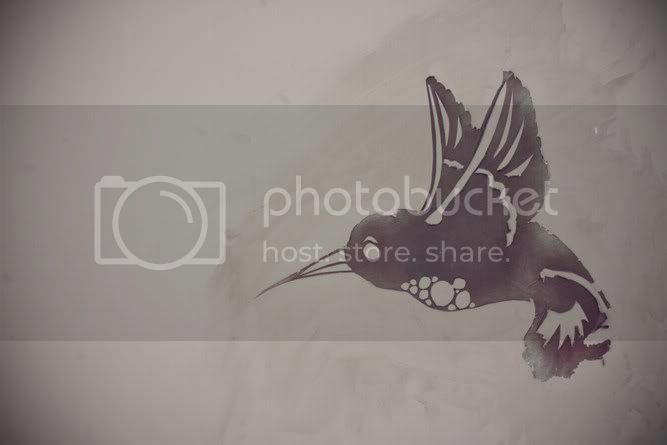 Just did a post on hummingbird pieces! You look lovely! Jamie, you look great! I love the washed-looking photos. You pull off this kimono top beautifully. Love the humming bird details! Love the kimono top! Very feminine : ) I just received my HANA product too, but I chose the blow dryer. I used it this morning and was super impressed! Love your whole look! The kimono top is gorgeous! I love this outfit and your kimono!! Amazing!! You are looking as gorgeous as always, and your hair is looking especially fabulous! Waw <3 Your photos are wonderful ! The top is beautiful! Another gorgeous outfit! light layers in the summer, LOVE! wow! you look absolutely stunning girl! love the photos!! i just picked up this same kimono top at f21 this past weekend :) looks so great on you... i like how how mixed it with the cutoffs. We love, love, love this look!! You look smashing!!! And the shoes are out of this world! Such a dream! I admire you for using affordable hair products, I'm the same way. I don't blow dry often, and dry shampoo is a lifesaver for me. Regarding that F21 kimono top - I'm in love! I adore it, and I want it! May you enjoy it! aw jamie! You look adorable!! But then again you always do! and sooo stoked for you for owning a Hana 1.5" iron, its life changing! hehe love mine! Great post! I reviewed the iron too here. Glad to have found your blog. I am having a great giveaway on my blog, check it out. I love those shoes! I bet they go with everything! Your wedges are insane. LOVE! 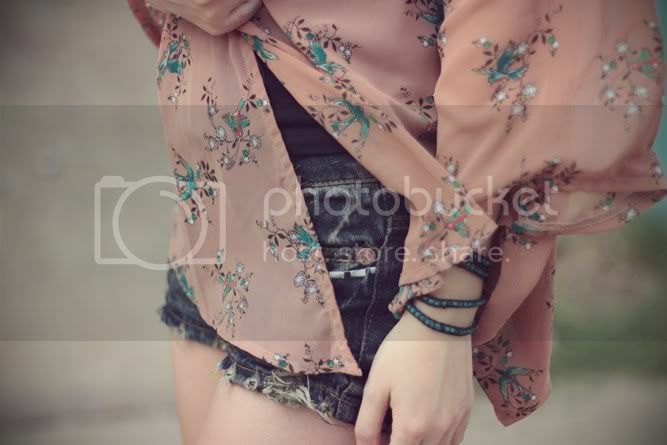 Love your outfit in this post and the way the photos are shot. You have such amazing shoes. I wish I had your closet. you are so cute!! 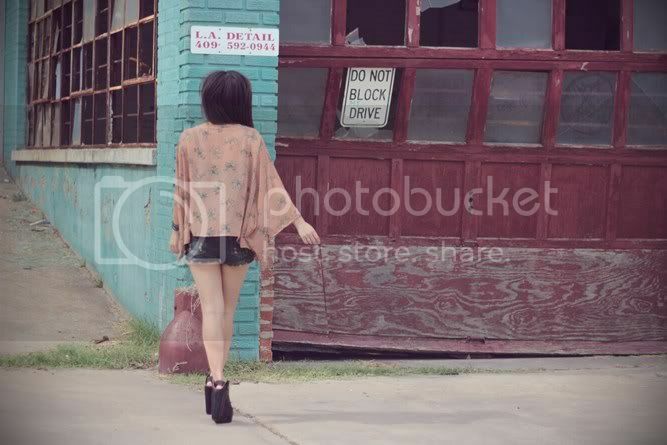 i'm infatuated with those wedges and that kimono top! do you really only shampoo + condition once a week? you're hair looks great! i wish i could get away w/ that! i am like you, i hate taking more than 15 min to get ready. i'm not a morning person! Thanks for the haircare tips! More expensive is really not always better.. I'm also amazed you only take 15 mins..wow! 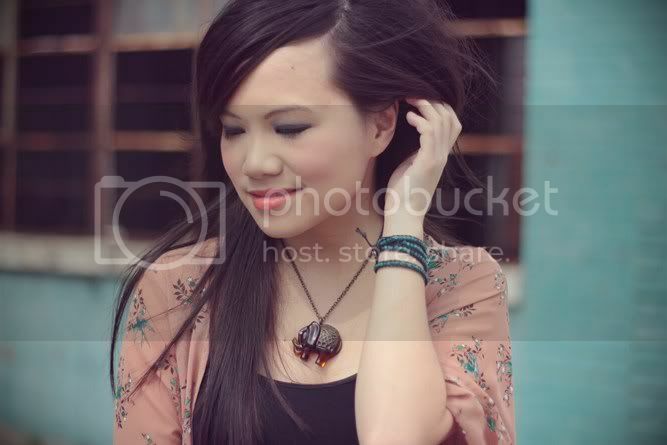 p.s.I am in love with your kimono-esque top and that super cute elephant necklace! I love the fabric (the print and colour are truly divine!) Your wedges are amazing too! You always have the greatest shoes! gorgeous kimono top! and thanks for sharing about the flat iron, they sent me on too (a different one) but i love it! Ah! Those wedges and that kimono are to die for! You look amazing as always, regardless of how long you spend getting ready! 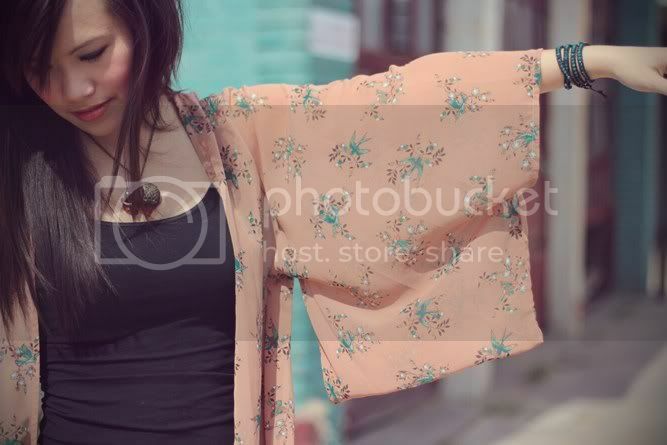 Gorgeous kimono top! I was at the new Forever 21 flagship in London this week, I couldn't spend anything because I'm saving for a holiday but it was so beautiful and I am definitely going back! Love your look! I want a kimono. this is one of my fave outfits from you !! So cute! I love the print on your blouse! This is very cute, i love it ! I love the color of your kimono top and your tribal inspired jewelry, very nice outfit! Love your kimono! I almost bought the same one the other day :) Looks great on you! sick sick sick!!! shoes! love them! I love the print on this kimono. Gorgeous shots! I love the pretty print on the kimono! It's always so pleasant to go to your blog and view all the pretty pictures of you...and yes your hair is always so gorgeous too!! if only it just takes me 15 min to get ready! ugh for me it's at least 30 min! WOW, that kimono def doesn't even look F21! rock it girll!! Beautiful photo shoot, from the styling to the backdrop. Like your shoes girl! perfect outfit! fits you really good! I love the F21 hummingbird print kimono top!! !